A surprise Valentine Encounter! Tuxedo Mask is here! Hello, beautiful members of the Galaxy Cauldron! It is I, Tuxedo Mask, here to spend Valentine's Day with you! Should you have any questions or special requests for me while I am here, post them in this board and I shall endeavor to answer them before I need to go! Tuxedo Mask, what do you know about a man called Chiba Mamoru? For you, CrystalSetsuna. Happy Valentine's Day! Chiba Mamoru? Hmm... well, from what I hear, he is an honorable young man. Very trustworthy. Rather quick thinking. I would trust him. Why do you ask? Also, what can you tell us about your beloved Sailor Moon? Sailor Moon is a true champion of justice! With her true heart and her friends' support, she will always triumph over evil! You analysts put your faith in Sailor Moon, for she will never let you down! ...sometimes she is a little forgetful, but she always pulls through in the end! tuxedo mask i have been awaiting your arrival on the GC. It is a dream come true. I wish you could stay longer. And I as well, fair maiden. One night amongst such shining stars leaves my heart yearning for more, but we must appreciate what gifts life gives us when it decides to give those gifts. For now all i can do is to wish I may find a way to visit with you all again in the future. Until that time, stay true, And always listen to your heart! Tacos are fried tortilla sandwiches loved by all! Their beefy filling is perfectly complimented by sauces concocted by talented chefs and their deliciousness should be shared the world over! Since you are here, I command thee to dance. Tux, why do you never show your love to other flowers beside roses? Sure, but only if I may dance with a maiden as lovely as you. 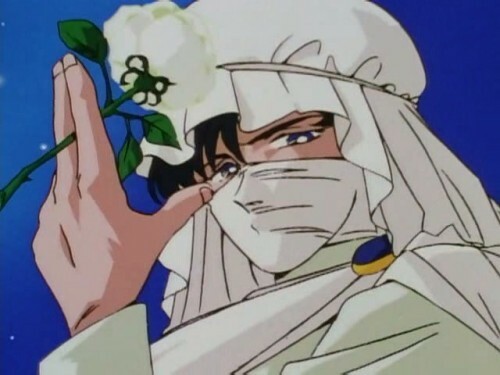 It was Tuxedo Mask's dearest wish to stay with all of you for the entirety of Valentine's day, but he was called away shortly after sending that last transmission to assist Sailor Moon in a fight against a monster intending to break up couples on their Valentine's Day dates, and was unable to return after the midnight hour. Instead, I, Moonlight Knight, shall carry on and answer these last two questions before I, too, must fade away until called on again to visit the forums and encourage you lovely young women to continue doing what you are doing and fight for yourself and your dreams. That being said, my time in your Kingdom, Sunyeons, was lovely and most welcoming, and I thank you sincerely for that. Why roses, you ask? A Rose is a symbol of love, and I use it in an attempt to serve justice to those who try to wrong others and act unfairly. Roses are beautiful and delicate, yet they can defend themselves quite well, and fight back against those who would harm them. My love of roses is my favorite metaphor for young women and the strong spirit that resides within them, and while other flowers might convey that point, I feel roses do it best. Goodbye, Shining Stars of the Galaxy Cauldron. Believe in yourselves and nothing can harm you!